Picked up this Remington 788 in .222 this summer and finally got to shoot it today. Only had a half box of Factory Hornady 50 grain ammo that came with the gun. Trigger could use some love but I think it shows potential. I've owned a bunch of 788's and every one has been a shooter. 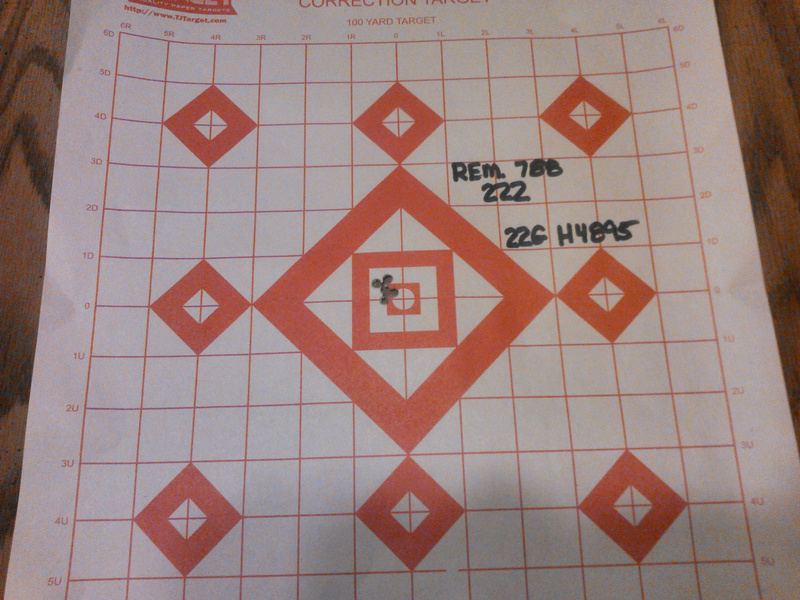 Last 3 shots @ 50 yards. 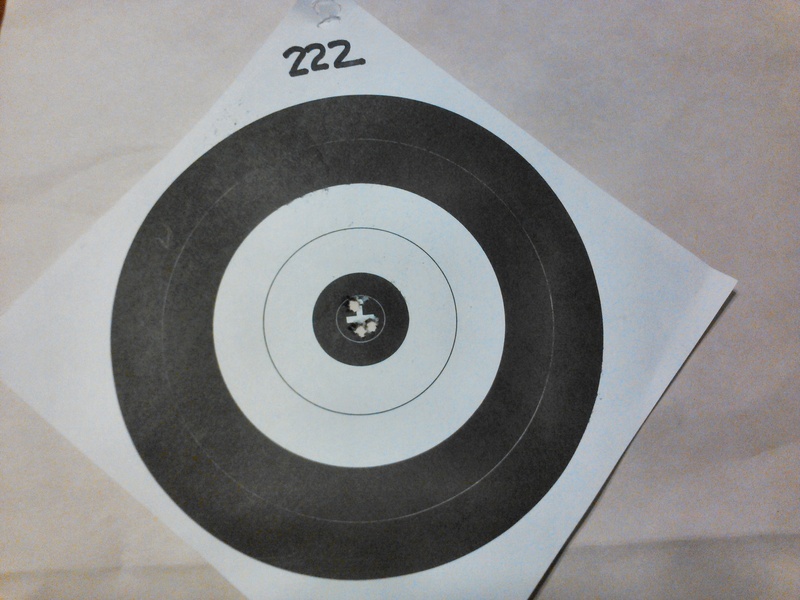 Most accurate rifle I ever owned was a 788 in 222 Rem. Look's like that stock was refinished. Nice looking rifle! My father in law had a 788 in 308 and it was a tack driver. Very nice grab there. You done good. 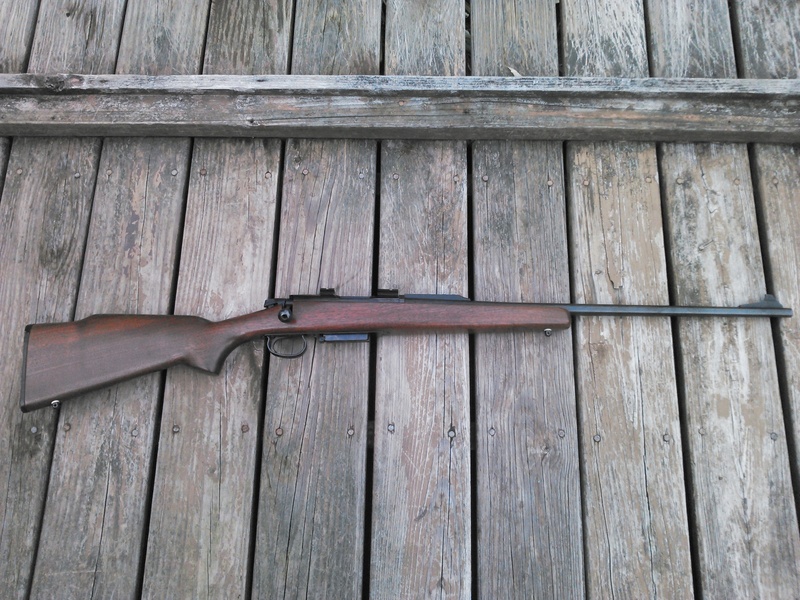 I have a 788 in 30-30 that was once owned by the Sate of Michigan Corrections Department. It too is a shooter and it came in a chunk of walnut that you do not see every day on a production gun. That is a fine rifle and a great find. In my opinion the 788 and the 222 cartridge are made for each other. It looks like it has a walnut stock. Many had a stock of something like beech or ash and had a dark finish applied, but they did make them with walnut too which of course is more desirable. Personally, I'd never let go of a 788, especially in 222! First load I tested yesterday and best group of 4 loads tested. Sierra Gameking #1390 55g HPBT. 22 grains H4895. Nice group. These guns are known for this kind of accuracy. You might have seen where I bragged about a 1/2” group fired from mine. Funny thing, that...the day I shot that one, it was very windy. The nearest local Weather Underground station which is maybe a couple of miles away showed sustained winds at 19 mph with gusts to 44 mph at the time I was shooting. At the range, the wind was constantly gusting and there was never a time of no or low wind. I did my best to shoot between the gusts. My best group was all shots touching in a line dispersed horizontally .467 inches center to center, with only about 3/16” vertical dispersion. I thought, well the wind caused the horizontal and if I could have shot on a day with no wind, that group would have been a little 5 shot cloverleaf! So yesterday I shot the exact same load. Same primer, brass, bullet, powder and charge weight. Much less wind. The group was over an inch and a half. 1.651” to e exact. Disappointment. Shooting various charge weights the best group of the day as .872. I was really hoping for better. Outside edge at the farthest point is .62 in that group, but that's only 50 yards. Time to get back to work so I'll put it away till next winter. I'll clean the trigger group and replace the spring then. I'm happy it likes the 55g Gamekings.